one thing that i love doing is putting together cute little packages! when i asked my bridesmaids to be in my wedding, i put together a package for them in order to ask them! i love giving gifts & so this was a super fun way for me to give them something & ask something in return! green wooden hearts - i wanted to use my wedding colors (yellow, green, brown) so i painted the hearts green. on the wood heart, i put a picture of a sunflower bouquet (that they would have at my wedding) and a picture of the dress i wanted them to wear! 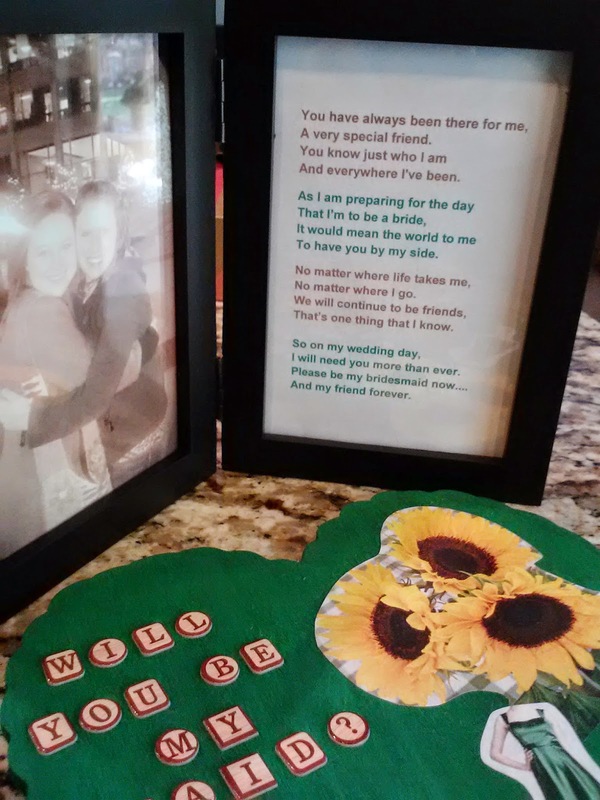 under that, i put "will you be my bridesmaid/maid of honor?" double picture frame - i printed off a picture of me with each bridesmaid (pre-wedding obviously) and put it in a double frame. on the other side of the frame i put a poem telling each one how much i enjoy our friendship & love them! candy - i put all of this into a cute little box & filled it with their favorite candy! i told you that to tell you this! i had loads of fun doing that & have been dying to do something similar again. so, when Jenna and Ryan starting getting pretty serious & talking about marriage, i secretly started a "yay you're engaged" package to give to Jenna when she got engaged! i had this package ready for a few months before Ryan popped the question. i am not a very patient person, so i think the day after Jenna got engaged [Memorial Day] i took this over to her house! one thing that i had such a headache figuring out when i was engaged... was how to get my name changed after the wedding & what order i needed to do it in! so, i thought i would save Jenna some frustration & share what i know! for instance, you have to change your name on your social security card before you can change it anywhere else. it will take the card about 2 weeks to get mailed back to you, so you have to do this first thing! sometimes there is a time limit to change your name on insurance, your job, etc., so getting the new social security card is priority! i printed off the instructions & name change form for the social security administration & added a few helpful tips on post it notes! i also printed off the name change form & new license form for the SC DMV because that is the second step! then, once she has a new Drivers License she can change her name everywhere else! for the rest of the package, i did a wedding theme where i gave her something old, something new, something borrowed & something blue! something blue a letter to Jenna from me (on blue paper!) telling her how happy i am for her, sharing a few challenges for the time of engagement, & sharing a few tips i learned from planning my wedding! & to go with the poem theme since i wrote my bridesmaids a poem with their packages... i found & tweaked a poem to the bride to be since we have now switched places where she is the bride & i am supporting her in her wedding! what is your favorite thing to do for newly engaged friends?! What a sweet gift! I love the thought of including a how-to for changing your name. It's a lot more complicated than people think! This is so cute! I wish someone had streamlined name changing for me, as I am still working on it and it's a drag!! this is such a sweet idea, so thoughtful! this is so cute! love the idea so much. i am stopping by from the blog hop and now following your fabulous blog! thank you :) you are too kind! yes! so complicated! and there are SO many things you have to change your name on that you don't even think about! anything is helpful! :) because when you start thinking about wedding planning it can be so overwhelming! haha. I am sure you are adding all kinds of fun! This is such a thoughtful gift! I love that you put items for encouragement + also some 'how to's' together for your friend. So sweet of you! I'm really terrible and have never really thought about getting friends engagement presents. Most of my friends are married (and have been for a while) but I should probably start doing this for anyone else I know getting married. Thanks for sharing this! You're friend is blessed to have you. right! cause it took me forever to figure all of that out & i want to spare anyone i can of the pain of that! haha!! I love this, SO MUCH! My husband's step brother just got engaged, and I'm becoming great friends with his fiance. This would be wonderful as a gift to her!